Before there was rock 'n' roll, there was the Telecaster. From humble beginnings came a revolutionary and elegantly simple new electric guitar that let musicians be heard loud and clear with sparkling tone and distinctive style. 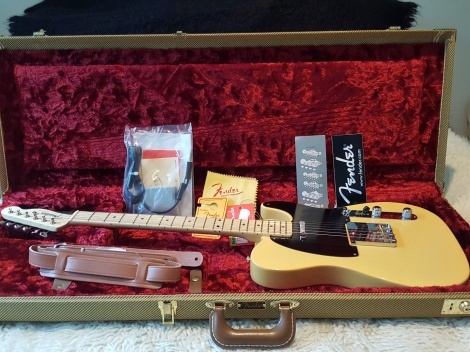 The U.S.-made American Vintage '52 Telecaster puts that original-instrument magic in your hands, built using original tooling and based on actual 1952 models. Specially voiced pickups meticulously researched and crafted, reproduce the authentic design, voice and performance of this instrument as in 1952. This instrument's thicker "U" neck profile (the shape of the neck in cross section) is sculpted to the most accurate period-correct spec possible, imparting an authentic vintage playing feel straight from 1952. Ideal for those who play with the thumb on the back or side of the neck. Flash-coat lacquer lets the instrument "breathe" with a more natural resonance, and imparts a more authentically vintage appearance. The meticulous vintage authenticity of this instrument even extends to carefully researched measurements of the various degrees of rounding on the edges of the body, neck and headstock. A string nut fashioned from bone contributes to superior tone and performance. American Vintage 52 Tele is complemented by a case that is every bit as vintage-authentic as the guitar.